“Remind me not to do this again next year,” Dave Mackey said with an uncharacteristic hint of despair as he neared the top of Sugarloaf Mountain. It was about 8 a.m. on the morning of August 18, 2018, and Mackey was 17 miles into the Leadville Trail 100, the classic 100-mile “Race Across the Sky” in the heart of Colorado’s Rocky Mountains. But he was also one of about 70 runners in the 715-runner field who was also six weeks into the grueling, summer-long Leadman competition—a series of six ultra-distance endurance events staged in the high-altitude environs of Leadville, Colorado—so he was feeling a bit ragged and tired. 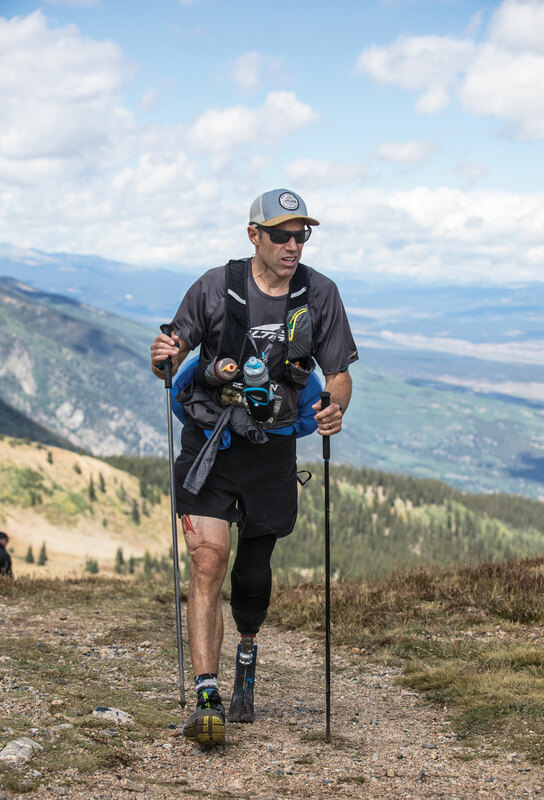 Not only was the 48-year-old physician assistant from Boulder battling fatigue from the series’ 100-mile mountain-bike race and 10K run the weekend before, but he was also dealing with chafing from his prosthetic leg. As a veteran endurance stalwart, Mackey knew what it would take to get through a hard 100-mile run. But as a relatively new amputee, he knew he would likely have a long, grueling day and night still ahead of him if he was going to finish and earn the celebrated Leadman pick-axe finisher’s trophy for the second time in four years. At his lowest point, Dave Mackey thought he’d never run again. At least not fast or with any purpose. And you couldn’t have blamed him for thinking that way. At his lowest point, Dave Mackey thought he’d never run again. At least not fast or with any purpose. And you couldn’t have blamed him for thinking that way. For a super-motivated, always-optimistic, tough-as-nails guy who relished tackling the hardest trails, the steepest mountains and the most grueling ultra-distance races with aplomb, it was hard to be very hopeful. It took 13 surgeries to repair his badly injured left leg that had left him with a debilitating limp and no sign of full recovery. So, the two-time U.S. ultrarunner of the year was only being realistic when he decided, 17 months after a horrific trail running accident in 2015, to voluntarily have part of the leg amputated. When it came down to it, he was happy just to be alive and blessed to have a happy, healthy family—wife, Ellen, daughter, Ava, then 8, and son, Connor, then 6—so he knew no matter what adjustments lay ahead for him, everything would be OK. He just wanted to get back to doing what he loved to do most—running up and down mountain trails—and he knew opting for amputation would probably present his best path to that, even if it meant the difficult process of learning to run again with a prosthetic leg. Mackey surveys the Leadville 100 course on a shakeout run in the days before the race. Photo by Matt Trappe. Putting in the hard work to overcome difficult challenges is what Mackey has done all of his life. 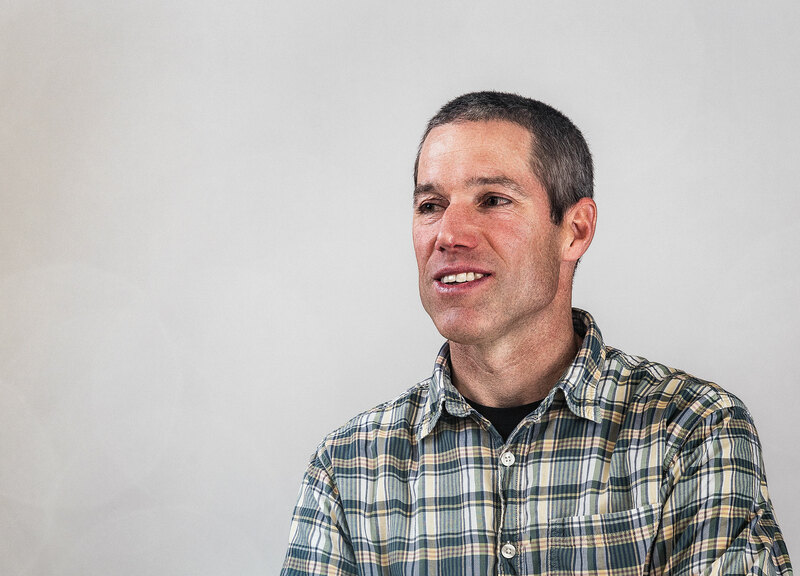 For nearly 20 years, he had humbly and quietly established himself as one the top adventure athletes in the United States, excelling in ultra-distance trail running, rock climbing and multi-sport adventure racing. His body of work included winning the Montrail Ultra Cup (in 2004 and 2011), trail-running national championships for 50K, 50-mile and 100K distances, earning podium finishes in international adventure races, breaking records scrambling up and down Boulder’s iconic Flatirons and setting the (since broken) Rim-to-Rim-to-Rim record for running 42 miles across the Grand Canyon and back. Just six weeks before his accident, he placed 12th in the harrowing six-day Marathon des Sables across the Sahara Desert in Morocco. He accomplished it all with a relentless work ethic and a deep toolbox of athletic skills, most notably a huge aerobic engine, amazing physical strength, uncanny body control on off-camber terrain and, perhaps his biggest athletic gift, a calm but tenacious demeanor in the face of adversity. After a bad patch going into the ghost town of Winfield, the race’s halfway point, Mackey dug deep on the climb back up to Hope Pass, and rallied to finish the Leadville Trail 100-miler last August. Photo by Glen Delman Photography. All of that seemed to be taken away on May 23, 2015, after a devastating fall while trail running in Boulder. Running one of his favorite trails to the top of 8,459-foot Bear Peak, Mackey decided to scramble hand-over-hand down the rocks on the back side—something he had done dozens of times before, using his considerable rock climbing skills. But when one of the rocks gave way, he crashed several stories and suffered a horribly broken lower left leg. 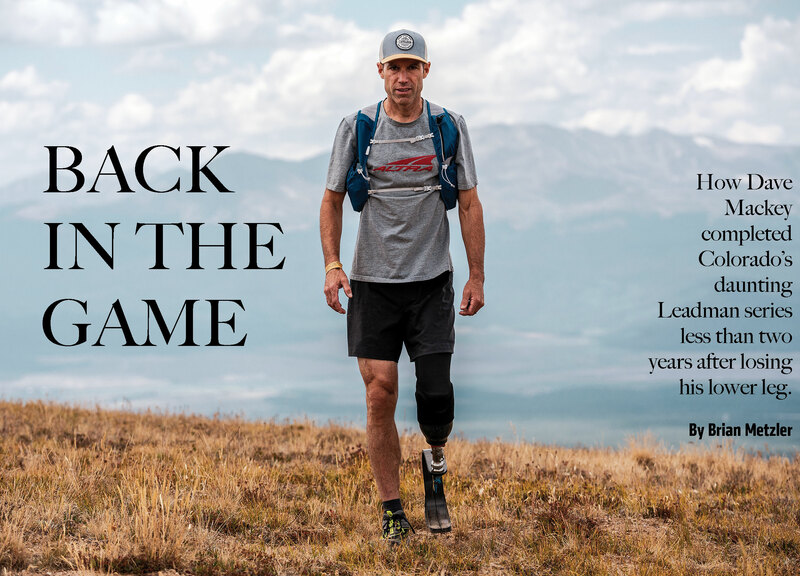 After numerous surgeries in Boulder and Denver to clean out the wound, re-set bones and harvest muscle from his quads to transplant to the lower leg, he finally returned home, a full three weeks after that fateful Saturday morning run. Even before he left the hospital, he started thinking about the races he wanted to do after he healed, and primary among them was a return to the Leadman competition and the Western States 100. He returned to work as a physician assistant in the Denver area, but the recovery process was long and painful and never quite complete. By the summer of 2016, he was riding his mountain bike and walking with a cane, but he was in discomfort and there were signs the leg still wasn’t healing. Inside, he was aching to get back to racing. He didn’t have any delusional idea that he’d suddenly rediscover an ability to run with the best trail runners in the country. he just wanted—and very much needed—to push himself beyond the painful edge of suffering that he had done so successfully for so many years. So, on Halloween night of 2016, he threw a going-away party, of sorts, for his leg, at a Boulder running store and embraced the collective support of his running friends. A who’s who of the local trail-running community had come out to support him, with both internationally celebrated athletes—Scott Jurek, Anton Krupicka, Hillary Allen, Zach Miller, Buzz Burrell, Darcy Piceu and Timothy O’Neill, among others—as well as dozens of passionate recreational runners who have been inspired by Mackey’s toughness and humility. Runners signed his swollen leg and foot with a Sharpie, ate cake and offered support to a guy about to undergo a massive, life-changing surgery just 12 hours later. Mackey relaxes after finishing among the top 25 percent in the 100-mile mountain-bike race. Photo by Matt Trappe. After the surgery, life didn’t necessarily get better right away. Sure, the anguish of cane-assisted walking with a painful limp was behind him, but that only led to new awkwardness and sometimes painful limping on his new prosthetic leg. It didn’t help matters that one of his prosthetics got lost in transit by a shipping company in the days before a family vacation. As it is with most amputees, it took months to get used to walking, sleeping and living with his new appendage. By mid-2017, he was starting to put it all together, but he knew his dream of returning to Leadman wasn’t yet in the cards. He’d spent most of the second half of the year hiking the rugged trails up Boulder’s highest mountains—including several visits to the site of his devastating fall on Bear Peak—mountain biking and trying to run with a prosthetic running blade, albeit with a very gimpy and unbalanced gait. Outwardly, he was happy to be making progress and have some semblance of normalcy back in his life, even though it was a decidedly new normal. Inside, though, he was aching to get back to racing. He didn’t have any delusional idea that he’d suddenly rediscover an ability to run with the best trail runners in the country; he just wanted—and very much needed—to push himself beyond the painful edge of suffering that he had done so successfully for so many years. That’s where he says he felt most alive, most comfortable and most in tune with the essence of what made him who he was. And, so, with hope in his heart and a renewed fire in his gut, one cold Colorado day last winter, Mackey registered for the 2018 Leadman competition, albeit two years later and under much different circumstances than he had originally hoped. With six grueling races in the span of seven weeks between 10,200 and 12,600 feet above sea level, Leadman is no small task. But having finished runner-up in 2014—just nine months before his accident—he knew precisely what he was getting into. So what if he had an artificial leg? He was still the same person who underwent the challenge in 2014. The thing about the Leadman competition is that it’s definitely greater than the sum of its parts. Grinding all summer at high altitude takes a toll on the body, as well as a competitor’s mind and spirit. But, so too is Mackey greater than the sum of his parts, the ones he was born with and the artificial ones that have become part of his daily life. There are essentially two main components to Mackey’s prosthetic leg: the custom-fitted carbon-fiber socket that secures the artificial leg to the silicone-wrapped, below-the-knee “stump” of his original leg and the foot attachments. For running is a carbon-fiber blade that offers some resiliency and stability but very little proprioceptive feel for the ground. 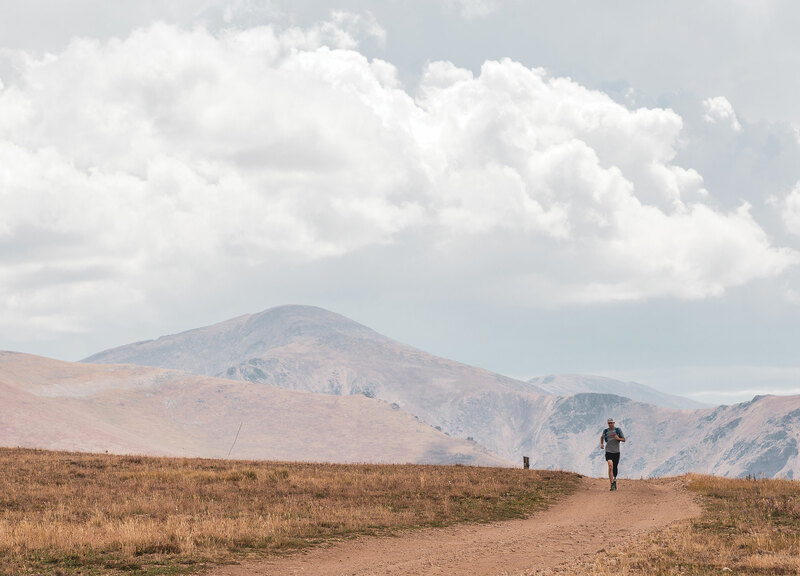 The keys to comfortable walking or running are proper alignment and a clean, near-perfect connection between the leg and socket, says Zach Harvey, Mackey’s Denver-based prosthetist. Anything less can cause annoying blisters, painful abrasions and inappropriate torque on the knee, but that’s magnified considerably during an ultra-distance trail run. In the Leadman 100-mile bike race on August 11, the weather ranged from 30 degrees early in the morning to 85 degrees by mid-afternoon. Photo by Matt Trappe. First, though, Mackey had to find out if he could finish any race, let alone six of the hardest events in Colorado. In January, 2018, he traveled to Bandera, Texas, where years before he had won a 100K U.S. national title. This time his outlook—merely to complete it—was understandably more humble. But true to his character, he persevered with a hobbling gait and reached the finish line in just under 6 hours, taking a respectable 43rd place out of 220 finishers. He continued to make progress and gain fitness in the spring, and in early June, placed 33rd out of 250 finishers at the Jemez Mountain 50K in Los Alamos, New Mexico. Mackey was one of only 100 courageous souls entered in the 2018 Leadman competition, but the only below-the-knee amputee ever to enter it. 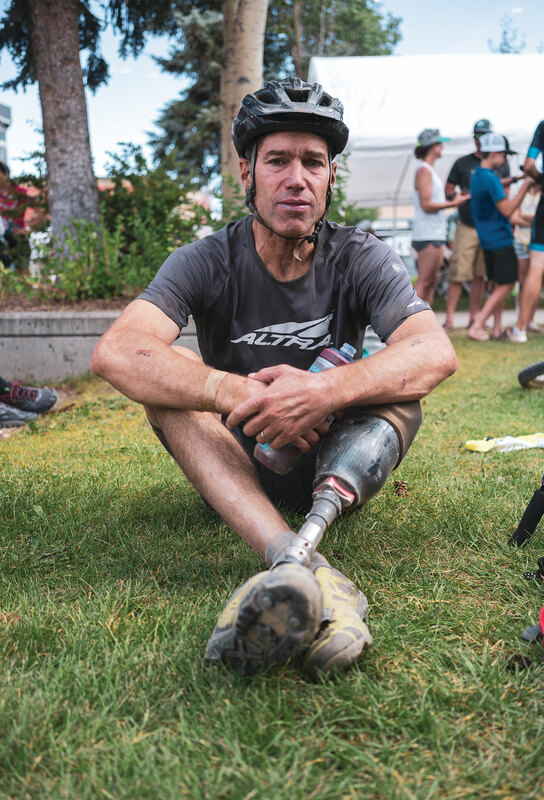 (“One-armed Willie” Stewart became the first adaptive athlete to earn the Leadman title, in 2017.) He didn’t know how tough it would be to run and ride 50 to 100 miles on a prosthetic leg, but says he felt he could rely on his relentless work ethic, huge aerobic engine and vast experience. The first task in the Leadman series is the late-June Leadville Trail Marathon, a 26-mile grind up to 13,185-foot Mosquito Pass and back. Runners consider it the hardest marathon in Colorado—even more difficult than the Pikes Peak Marathon—because of the steep and very technical sections up and down the final approach to the pass. After another month of training and a new outsole on his blade, Mackey was ready for “Hell Week” ... That’s 206.2 miles of racing at elevations above 10,000 feet. Fit and hungry to compete, Mackey stormed up and down the rocky trails with seeming ease, finishing in 4:52:42 as Ava and Connor ran stride-for-stride with him over the final 50 yards down Sixth Street. Not only did he place 53rd out of 679 runners, his time was only about 40 minutes off what he had run in 2014. 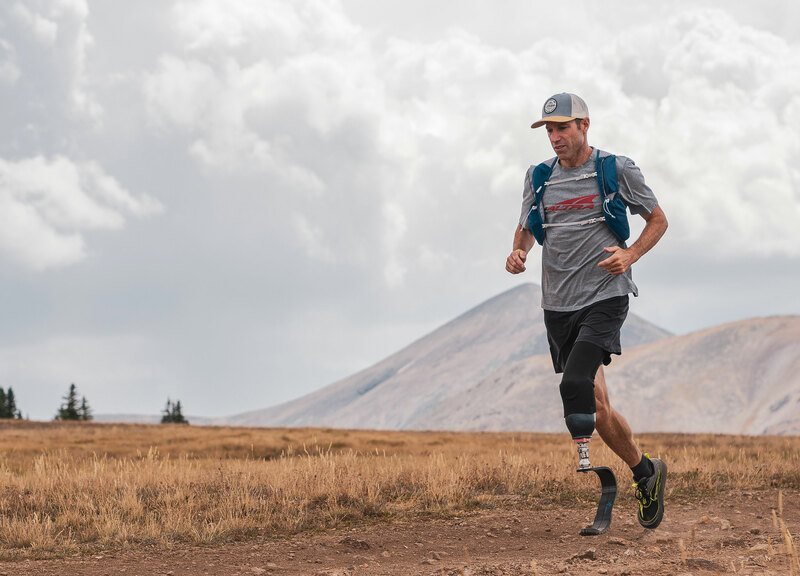 To run like that on such rugged terrain with a prosthetic leg was a big confidence boost, especially knowing how relatively limited his training had been since his amputation. Three weeks later, Mackey turned in a solid performance in the Leadville Silver Rush 50-mile mountain-bike race (5:29, 127th out of 564 riders), followed by a strong (if frustrating) performance in the Silver Rush 50-mile trail run the very next day (9:45:03, 62nd place out of 478 finishers). As a Leadman competitor, he had the choice of doing either the 50 bike or the 50 run, but he opted for both because, well, that’s what Dave Mackey is all about. Still, the 50-mile run was the most daunting thing he had done since his accident, and, perhaps needless to say, the slowest of his life. That was because of the duration and technical terrain and fatigue from the previous day, but also because of a brief summer storm that brought a cold, drenching rain and blankets of hail. Making matters worse, the rubber outsole affixed to the bottom of his carbon-fiber blade came loose midway through the race and had to be duct taped into place. That worked for a bit, but it came entirely off over the final 20 miles, making the foot placements slippery and precarious. Still, he embraced the challenges and took comfort in the new perspective he was starting to realize. After another month of training and a new outsole on his blade, Mackey was ready for “Hell Week,” the eight-day period in mid-August when Leadman competitors tackle a 100-mile mountain-bike race, a 10K trail run and the daunting 100-mile run. That’s 206.2 miles of racing at elevations above 10,000 feet. After jamming through the bike race (9:40:53, 392nd place out of 1538) on August 11 in weather that ranged from 30 degrees early in the morning to 85 degrees by mid-afternoon, Mackey completed the deceptively hard downhill-uphill 10K the next day in 55:45 with a second-half surge that helped him pass more than 75 runners. Even in the days after he was injured, Mackey knew he wanted to return to the Leadman competition. Photo by Matt Trappe. He started the race conservatively, taking his time on the dirt road and the dicey singletrack sections over the first 13 miles of the course. By the time he reached the 18-mile mark atop of Sugarloaf Mountain, though, he had to stop, remove the leg to add some lube and make adjustments to reduce irritation from medial-side chafing. He continued on, amid overcast skies and two hours of drizzling rain, all the while feeling far from his best, he said. When he left the Twin Lakes aid station at mile 40, he knew the trek over 12,600-foot Hope Pass and back was going to take every ounce of energy he had. By the time he had gone up and over the pass and arrived at the historic mining settlement of Winfield just shy of the 12-hour mark, he was in 235th place in the race and still within range of his 24-hour finishing goal. But his body was trashed, and, uncharacteristically, he was ready to drop out. He got an energy boost by taking in a bunch of calories and rehydrating at the 50-mile aid station. He also got an inspirational lift by seeing several friends, including Bob Africa, who would pace him back over Hope Pass to the 60-mile mark and motivate him for the rest of his long journey back to Leadville. And so Mackey did what he has always done. He dug deep. Reflecting back on his accident, the surgeries and the decision to amputate his leg, he thought of his wife and kids and reminded himself how blessed he was to have lived through the experience. He remembered the many dark days when he thought he might never run again. 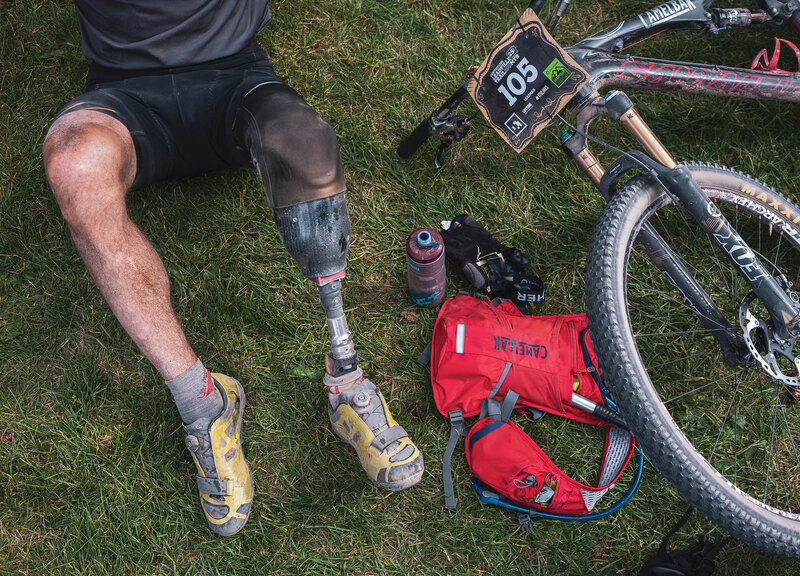 And, yet, here he was, 40 miles from finishing the Leadville Trail 100 and completing the Leadman series for the second time in four years despite losing part of his left leg. Over the final 40 miles, Mackey, paced by Mike Hewitt, was motivated anew, running strong, barely stopping at aid stations and passing dozens of runners who had succumbed to walking most of the way back. Through the dark of night and into the wee hours of the morning, he looked like his old self, charging hard in the face of fatigue and adversity. But this was his new self, charging ahead proudly with his same old tenacious ways. Almost symbolically, Mackey trudged the final miles into Leadville as the first light of the new day started to appear in the sky. He crossed the finish line in 24:54:49, just fast enough to earn him the big gold commemorative belt buckle sub-25-hour finishers receive. Furthermore, he finished 12th among the 100 Leadman participants, proving he was still capable of competing with elite-level athletes in some of the world’s most grueling ultra-distance races. Finishing Leadman was not an end for Mackey, but instead a new beginning. He has plans to do more racing in 2019, including the Western States 100. In some ways, as much as things have changed—dramatically in some ways—plenty has remained the same. Dave Mackey is still the same tenacious, competitive and humble guy he ever was. Brian Metzler is the founding editor of Trail Runner. He also completed the Leadman series in 2018, humbly and gracefully finishing behind Mackey in every event. Mackey has always been a grinder, someone who relishes the challenge of a difficult endurance quest. Photo by Matt Trappe. Amazing, simply amazing. His grit makes me want to never complain again! Wow. What an amazing guy. Just goes to show what one can overcome with the will and the heart. He inspires the hell out of me! Great article , amazing pictures well done all. This guy knows the true meaning of a happy and fulfilling life, and he’s willing to make any sacrifice to keep his dreams alive. Great story guys…makes me wanna go out and run trail.